OSSkin.Net enables developers to skin windows forms .NET applications from a choice of 22 authentic looking skins including Windows XP, Windows Vista, Windows 7, Aero, Office 2007, Office 2010 and Mac OS-X themes. 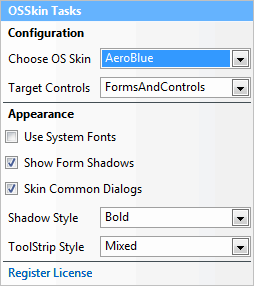 Thanks to an advanced skin engine designed entirely in C#, it is the only skinning product currently available that completely skins all windows forms .NET forms, controls and dialogs. OSSkin supports dynamic alpha-blended drop shadow effects on all forms and dialogs, a feature unique to our product and available on all platforms. Your application forms will literally spring to life popping right out of the screen. The System style draws ToolStrips using skinned elements. The Professional style draws ToolStrips using skinned gradients and colors. The Mixed style draws ToolStrips using a combination of skinned and gradient styles. OSSkin installs directly into the Visual Studio Toolbox. Setup is easy, just drop the component onto the main form of your application, or the first form the users see's when running the application. Using the built-in Smart-tag designer you can then customize every aspect of the skin and set your preferences without having to modify your project or source code. You can also change any appearance properties on the component at runtime, your application GUI is automatically updated in realtime to reflect the new settings. SkinSoft developed a platform independent skin engine that does not require uxtheme or a 'theme aware OS' such as Windows XP, so your skinned applications will always look the same on all Microsoft platforms from Windows 2000 upwards. Click on an image below to see a full skin preview.